McLaren-Honda’s had a triumphant few weeks. 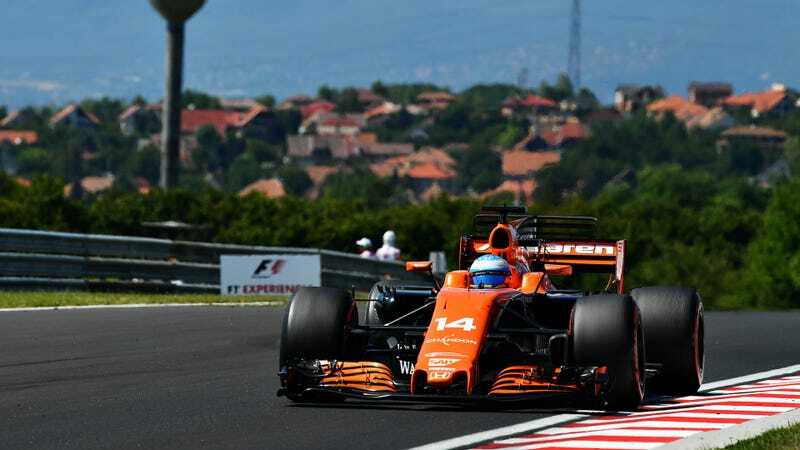 Driver Fernando Alonso scored the team’s first points of the Formula One season at the Azerbaijan Grand Prix in June after a mere eight races of going scoreless, and he even set the fastest lap time at the Hungarian Grand Prix. Things are looking up. But so are Honda’s goals at the only F1 team that’ll run its terrible race engine, which, unfortunately, is just setting this group up for failure. The team, blinded by its newfound ability to occasionally finish a race without a car falling apart or dying a terrible, smokey death, decided it wants to overtake Renault as only the second-worst engine supplier in F1. It sounds reasonable given that there are only four engine suppliers in F1 at the moment, but then you remember how bad Honda is and all of that goes away. “I think we can keep the same ratio of the increasing of the power but it is difficult to catch up Mercedes or Ferrari,” Hasegawa told Autosport. When asked if he believed that would be a genuine possibility, given Honda’s current horsepower deficit to its rivals, Hasegawa replied: “Yes, I can see that on the data. Hasegawa added he felt this was the closest Honda has been to its rivals since returning to F1. Renault, we must not forget, supplies the rather terrible and unreliable power unit for the Red Bull F1 cars that can actually make the podium. Red Bull calls the not-great engines “Tag Heuer” power units because F1 is often petty and silly. But even with those power units, Red Bull is still third in the F1 team standings with 184 points to the leading Mercedes team’s 357. McLaren-Honda is ninth out of 10 teams, with a whopping 11 points scored between its two drivers over the 11 races so far. They haven’t scored at all in most of them. The only team behind McLaren Honda is Sauber, which thought about switching to Honda engines the other week before waking up from whatever alternate dimension it was in where that seemed like a good idea. But, by all means, more power to Honda for setting goals. You have to start somewhere, even if you never make it more than a few steps away from the starting line.